Not a TimeformUS member? Sign up to access free PPs for this race. I’m a big fan of LOVER’S KEY (#6), and I think she is the horse to beat in this race. She was projected to be the controlling speed two back when she was beaten by Lady Joan (#4). However, even though Jose Lezcano did ride her to the front early, he quickly reined her in to such an extent that he basically surrendered her pace advantage while letting the others get into the race. Lady Joan was basically even with her by the time they reached the top of the stretch, and Lover’s Key couldn’t quite fend her off. Junior Alvarado rode her the right way last time, taking advantage of her ample early speed to create some distance between her and the rest of the field. There is more pace in this race, but I don’t think she needs to be in front early, as she proved in her last start in Florida. She got some crazy rides from a low-percentage rider in those Gulfstream Park races, making premature moves on almost every occasion. Despite that, she showed that she’s perfectly capable of handling two turns, which gives her a distinct advantage over her foes in this race since many of them are stretching out from sprints. 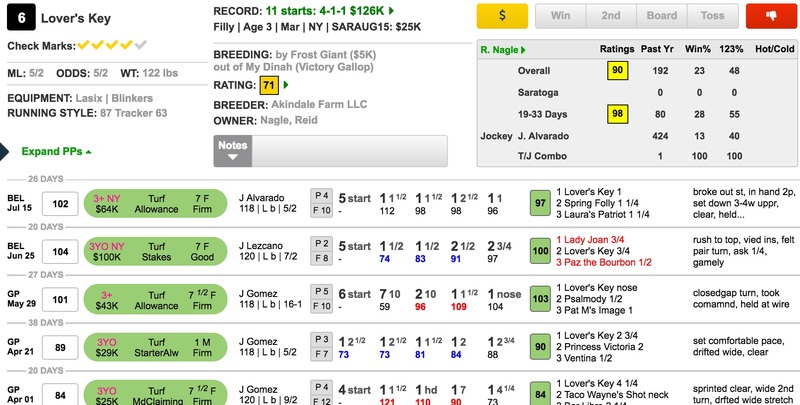 Her trainer, Reid Nagle, has fantastic numbers overall and gets a 100 Trainer Rating with turf starters. I’ll use her with the aforementioned Lady Joan (#4) as well as Paz the Bourbon (#1), who may be better sprinting but did win around two turns as a juvenile, and recent maiden winner She’s Dreamin (#2). Pies may be wise,but if”Trading Kisses”comes in,we’ll hafta be paying taxes. “Lover’s Key”is not for me,but I wish you luck.”Carry Your Heels”slightl;y appeals. 9th. Race. Wood chip workout specialist johnny sheppard looking to light up the tote in a bad race…..